The extant representatives of these two taxa have a complementary distribution, with the Aramidae occurring in South America and Central America, and the Gruidae on all other continents. A putative member of the Aramidae from the early Oligocene (Brule Formation) of South Dakota was described as Badistornis aramus by Wetmore (1940). This species is known from a nearly complete tarsometatarsus, which resembles that of extant Aramidae in the strongly plantarly deflected troch-lea for the second toe. Its classification into the Aramidae was also accepted by Cracraft (1973a), but the fossil record may be too incomplete to be confident about the phylogenetic affinities this species. Chandler and Wall (2001) described three eggs from the early Oligocene of the Brule Formation of South Dakota, which they assigned to B. aramus. Loncornis erectus Ameghino, 1899 from the late Oligocene (Deseadan) of Argentina is based on a fragmentary distal femur. The species was classified into the Aramidae by Brodkorb (1967), but its affinities are indeterminate (Cracraft 1973a; Agnolin 2004). 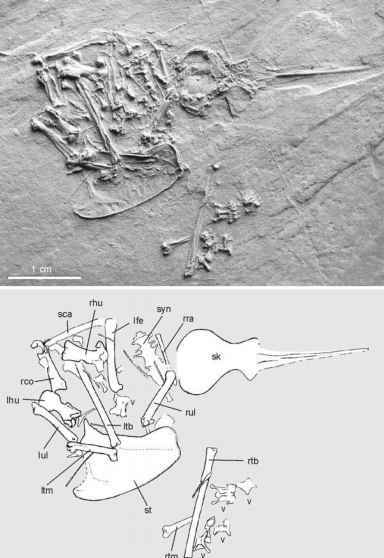 Paleogene species of putative Gruidae are Palaeogrus princeps (Portis, 1884) from the middle Eocene (MP 11-13; Mhkovsky 2002) of Italy and P. hordwellien-sis (Lydekker, 1891) from the late Eocene (MP 17; Mlikovsky 2002) of England, which are both based on distal tibiotarsi (Cracraft 1973a; Harrison and Walker 1976a). A smaller species, Geranopsis hastingsiae Lydekker, 1891, occurs in the late Eocene and early Oligocene of England, and is known from coracoids and a referred distal tibiotarsus (Fig. 9.4; Harrison and Walker 1976a, 1979a). As noted in Sect. 6.4.2, the coracoid of this species closely resembles that of the putative anseranatid Anserpica from the late Oligocene of France. Mourer-Chauvire (2006) further noted the presence of Gruidae in the Quercy fissure fillings. The fossil record of cranes outside Europe is equally sparse. Eobalearica tuga-rinovi Gureev, 1949 from the middle Eocene Ferghana Basin of Uzbekistan is based on a distal tibiotarsus. The holotype and only known specimen is, however, poorly preserved, and its identification as a gruid was doubted by Cracraft (1973a). Rasmussen et al. (1987) assigned a distal tarsometatarsus from the early Oligocene Jebel Qatrani Formation of Egypt to the Gruidae. According to Olson (1985, p. 164, 1989, p. 2024), there further exist fossil cranes from the late Eocene (Chadronian) of North America.